A huge 'thank you' to everyone who attended my book release party Saturday--it was an unprecedented success, and I had an absolute blast. Special thanks to Alex and Elsbeth at Rocketship; Marion, Michele, and Alex for the photos; Steve and Matt for providing soundtrack help; Gina for bringing cookies; and Dave for helping me run everything smoothly (and doing all the other voices during my reading!). 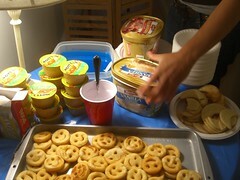 Braces-friendly food: applesauce, blue Jell-O, ice cream, smile-shaped cookies, and Smile French Fries! The live reading and presentation, in front of a packed house. The past couple of weeks have been amazing: thanks to everyone who has emailed me, blogged, Tweeted, Facebooked, linked to my site, sent text messages and photos, written reviews on Amazon and Goodreads; bought the last copy at their local store; asked store owners to order the book; lent their book to a friend; or simply told me they enjoyed it. I'm blown away by the response so far, and can't wait to share Smile with more new readers. Thank you. Really...I can't say it enough!